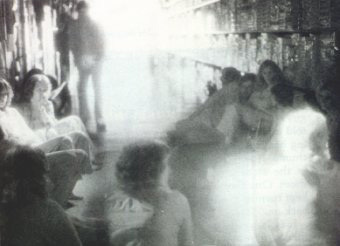 This image was caught on infrared film during a paranormal investigation at a Toys R Us in Sunnyvale, California, for the television series "That's Incredible". The man seen leaning on the wall was not observed by the others present. High speed film shots taken at the same time as this one showed no trace of the leaning figure! This Toys 'R' Us has a long history of being haunted by a ghost called "John" and store workers are used to see strange things happening, such as objects moving on their own! Read this snopes.com ghost article to learn more.